Pe Maung Tin is one of those rare Burmese scholars, who reached recognition beyond his own country. His work and personality have often received appreciation, also in English literature. It was in the 1920ies and 1930ies when he made his great contributions to Burmese society. His aim was, together with some Burmese and British friends, to make Burmese traditions meet the challenges of contemporary international modernity. Pe Maung Tin was born on 24. April 1888, at Insein. His father, U Pe was superintendent of Insein Veterinary Department and his mother was Daw Myaing, both Baptist Christians from central Burma. U Tun Nyein, who compiled the well-known first English – Myanmar Dictionary and tramslated the Bible from English into Burmese, was his uncle from his father’s side. His maternal grandfather was the Taunghkwin (highest patriarch) of the Buddhist sangha of Upper Burma. He was known as “Maung Tin” during the first years of his life and added his father’s name later. Despite coming from a Christian family, he received his primary education from 1893 to 1896 at a private school where he was taught classical Buddhist texts. In 1896 he changed to a government high school in Rangoon where he won his first prize at the age of 14. More prizes followed after he entered college. At the age of 15 he led a boycott at his school to protest the custom of joining hands in a prayer gesture when addressing foreign teachers. The order was revoked afterwards. In 1906 he entered Rangoon College and studied Pali and finished his M.A. in 1911. Only one year later, he became professor after his teacher, a European, had been promoted to another post. From the beginning of his academic career Pe Maung Tin associated himself with other scholars both from Burma and abroad. He was a founding member of the Burmese Research Society in 1910 and contributed many articles to its journal. His first article entitled “Missionary Burmese”, a critique of the linguistic skills of foreign missionaries, appeared in its first issue in 1911. He acted as the first editor of the journal and became treasurer of the society in 1912. 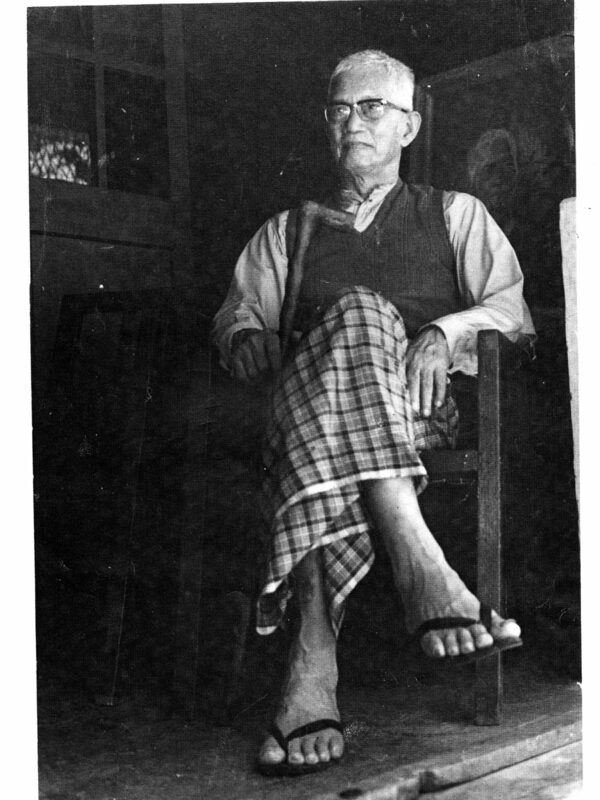 As professor of Pali, he had contacts with Pali Text Society based in London and from 1916 on he started to translate canonical Pali texts into English as well as Burmese. In 1920, the year of the founding of Rangoon University, he went to London and studied in Oxford and London until 1924. His contacts with the Pali Text Society and its presidents, Thomas (until his death in 1922) and Caroline Rhys Davies, intensified. During the time he spent in England he compiled a ground breaking translation of a historical Burmese work, the Glass Palace Chronicle. The chronicle was compiled in the first half of the 19th century at the royal court in Amarapura. Pe Maung Tin’s translation was published in 1923. The work was a joint venture with Gordon C. Luce (1889-1978), professor of English literature in Rangoon since 1911 who had married Pe Maung Tin’s younger sister in 1915. It was a translation that showed Pe Maung Tin’s qualities as a historian as well. Luce and Pe Maung Tin became lifelong friends. Their cooperation helped the British professor to become a leading expert on Burmese ancient history. With regard to the translation of the Pali text, Pe Maung Tin laid the fundement and his brother-in-law polished the English style. After his return to Burma, he continued his work as a professor and laid the foundations for the university’s “Oriental Department”, comprising Pali und Burmese studies. One main impact of his teaching was the emergence of a new literary movement in Burma called khit-san (“testing the age”) that started with articles, short stories and poems written by some of his students in a “modern” style. On the other hand, Pe Maung Tin supported John S. Furnivall, the co-founder of the Burma Research Society, in his efforts to promote the intellectual advancement of the country by educational means. One instrument to achieve this aim was the bilingual monthly periodical The World of Books published from 1925 on, another one was the Burma Education Extension Education Association established in 1928 promoting reading circles and encouraging people to contribute to the monthly periodical. In 1928, he married Daw Kyi Kyi, called Edith, in an Anglican church. The couple had two daughters. In 1937, Pe Maung Tin was the first Burmese to be appointed principal of University College and during the Japanese occupation he had to serve as the chairman of the university’s advisory board. In 1946, he retired. After he continued to write articles on a variety of topics in the field of linguistics, literature and history. The bibliography of his works contains 227 entries. In 1957-58 Pe Maung Tin visited the United States to lecture on Buddhism at the University of Chicago which awarded him an honorary doctorate. In Kuala Lumpur in May 1959 he attended the inaugural assembly of the East Asia Christian Conference. The Burmese U Kyaw Than was elected general secretary at the meeting. Today, the organisation, renamed Christian Conference of Asia (CCA) in 1973, represents more than 100 member from Asian countries. Pe Maung Tin later went to China as a member of a cultural exchange delegation. In 1961 he contributed to the first Buddhist-Christian dialogue of South East Asia, which was held by the East Asia Christian Conference under U Kyaw Than at Holy Cross College, Yangon. He made a critical comment on the cultural approach of Western missionaries. This dialogue proved to be an important Asian input to the first assembly of the World Council of Churches in Asia in New Delhi 1961. From 1960 to 1964, Pe Maung Tin served as chairman of the Burma Historical Commission. He led the Burma Translation Society in compiling the Burmese Encyclopedia. In 1968 the Burmese Research Society marked his 80th birthday with a special celebration. During his retirement he served as professor of the Holy Cross College, Yangon, one of the leading theological seminaries of Burma affiliated to the Anglican Church. As a practising Christian, he was as a founding member of the Burma Christian Council, and took charge of the Christian Literature Society. He was the chairman of the Study Commission on Buddhism of the Burma Council of Churches. Pe Maung Tin died on 22 March 1973. U Pe Maung Tin was keenly aware of the “clash of cultures” – the political confrontation with European colonialism and culture, and the religious encounter with Christianity, mainly from US-American background. His response was the profound study of history and culture of his own country. At the same time, he reflected his personal position at the cultural crossroads, being a Christian in a Buddhist country. His answer was to support a natural patriotic spirit vis-a-vis the colonial presence, together with his great effort of deep reciprocal respect, understanding, trustfulness and reconciliation. His response to the cultural challenges by colonialism was to emphasise the importance of Myanmar language (b’ma) for the cultural development of Myanmar as a nation, and also the importance of the establishment of a literary and intellectual climate in Myanmar that would combine the traditions of the country with those coming from abroad. That is why he made strenuous efforts for the higher qualification of Myanmar language and literature in his life time. One of his achievements was that all schools whether government or missionary, were required to teach compulsory Myanmar language in their studies. At the same time, he sharply criticized his fellow Christians, for not studying Pali and Myanmar language and Buddhist culture. He was interested in the two cultures to meet, despite the colonial context of the time favouring anti-western sentiments. He later extended his insights in the fundamental role of language as a medium of intercultural exchange. In March 1954, a three-day seminar on linguistics was held in Rangoon which aimed as using this academic discipline as a tool to bridge the cultural differences between Burma and the English speaking world as well as between the different linguistic and ethnic groups. A newspaper article that possibly was written by Pe Maung Tin but certainly was inspired by his intentions, summarised the intentions of the seminar thus. Here, linguistic research is linked to the necessity of meaningful communication inside Myanmara multi-ethnic mulit-lingual country, and at the same time the necessity of using English as a second language taught in the schools besides Burmese. U Pe Maung Tin was an intellectual and a reformer who tried to use his great talents to reconcile Burmese traditions and western modernity. As an outstanding scholar in the late colonial period he exerted some influence on the literary scene of the country that tried to connect Burma to the world without losing its cultural identity. Pe Maung Tin’s attempt to combine Burmese traditions with western modernity was only partly welcomed by the young revolutionaries who became the leaders towards independence. The cultural revolution on which their political activities was based, was not a dialogue between the Burmese and the western “world of books”, but a “Burmanisation” of the contemporary knowledge and literature. The young members from the Thakin movement – Nu, Soe, Than Tun and Aung San – founded the Nagani (Red Dragon) Book Club that published books in Burmese language only in the interest of supporting a political revolution by cultural means.2 After the war had started in Europe, this group exchanged the pen with the sword and finally achieved independence with the help of a national army. Compared to the literal and political nationalism of the Thakins and their mass followers, the cultural reform that Pe Maung Tin wanted to support could be termed “cosmopolitan”. Looking for a sound cultural base for Myanmar citizens, Pe Maung Tin advocated making use of a blend of cultures to be comprised in the texts of national textbooks as well as in the sermons of Christian preachers. This attitude is founded in his love of the literature and culture of Myanmar, accompanied by an estimation of European traditions of academic enquiry. This attitude did never represent the mainstream of Burma’s political culture. It was rather characterised by external and internal confrontation due to the memories of colonial rule and ongoing civil war that commenced shortly after independence. After the military coup of 1962, Burma became a secular “hermit country” under general Ne Win’s leadership. The “Burmese Way to Socialism” which was implemented, dramatically affected not only Burma’s cultural climate, but also all other segments of Burmese life. Pe Maung Tin was not directly affected by the „climate change“ during which a Burmese “union culture” was promoted corresponding to a strict political neutrality and economic self-reliance. Cultural exchanges with neighbouring countries and as well with the West, were no longer encouraged. It were others that felt the consequences of the new order. Gordon Luce, Pe Maung Tin’s brother-in-law, was ordered to leave the country in 1964. His wife was asked by the top leader to stay, but she accompanied her husband. His huge library was impounded by the authorities and Daw Tee Tee, Pe Maung Tin’s sister, was even stripped of her wedding ring because no jewellery was allowed to leave the country.3 It is not known how Pe Maung Tin reacted to such harsh treatment of his friend and his sister. He did not witness the end of the Burma Research Society and its journal that was terminated by the government in 1977. Today, Pe Maung Tin is still admired as an intellectual genius in Myanmar but as a rather singular one. Not many contemporaries follow his approach today in the present climate of a new Myanmar nationalism and massive Western criticism of consecutive Myanmar governments. Pe Maung Tin’s cosmopolitan” approach to reconcile Burmese and western cultures ist still not realised. Anna Allott 2004 Professor Pe Maung Tin (1888-1973). The Life and Work of an Outstanding Burmese Scholar. In: The Journal of Burma Studies 9, 11-34. Khin Htwe Yi 2016, Biography of Pe Maung Tin (http://www.emw-d.de/fix/files/37%20biographies_myanmar.pdf). 2For more details see the Myanmar Literature Project that published a number of working papers on the Nagani Book Club: http://www.phil.uni-passau.de/suedostasien/wissenschaftsnetzwerke/wissenschaftsforum-myanmar/myanmar-literature-project/.